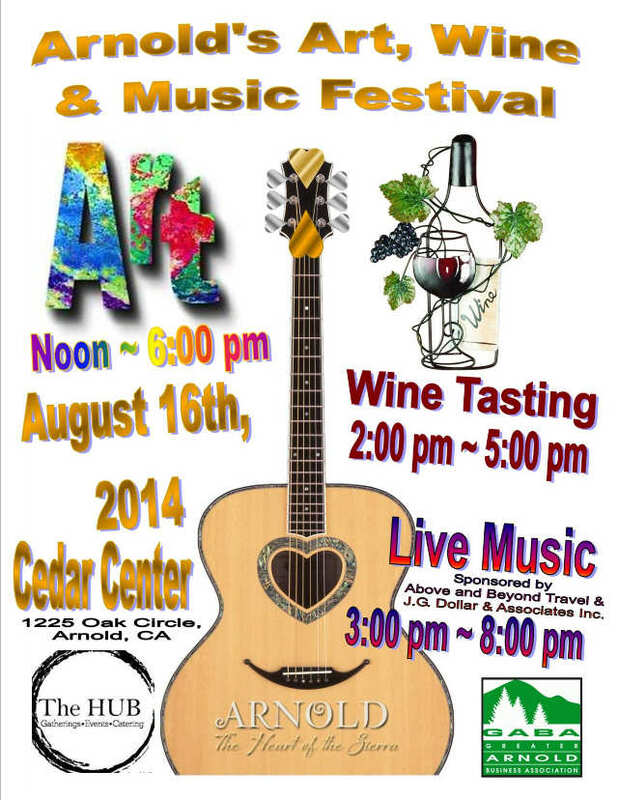 Arnold, Ca...Greater Arnold Business Association presents the 9th Annual Arnold Art, Wine & Music Festival on Saturday, August 16, at Cedar Center (The Hub) in downtown Arnold. Directions are easy – go East on Highway 4 through Arnold until you come to El Dorado Savings Bank on the left. Turn left onto Oak Circle. The park is between Hwy 4 and Oak Circle. There is no entrance charge. Cedar Center offers a grassy, shady area, so bring your lawn chairs and blankets and beat the heat! The event runs from 12PM – 8PM with art for sale, great food, wine, and live music from 3PM to 8PM. Wine tasting from 2pm – 5pm will be $15 per person and includes a really cool glass and a “passport” to taste wines from the various wineries. Participating wineries will include: Black Sheep Winery, Brice Station Winery, Chatom Vineyards, Hovey Wine, Ironstone, Milliaire Vineyards, Stevenot Winery, and Zucca Mountain Vineyards. Food will be available from Arnold Pantry and Johnny’s Catering and Beverages will be available from GABA. All proceeds this year go towards Promoting Local Businesses in and around the Arnold area. Join Milliaire For Our Barrel Room Bash Series! Chris Webster & Nina Gerber Coming To The Black Bart Playhouse! “Love The Forest” Rocks On Presidents Weekend! Reggae Night With Dyemusica This Weekend! The 15th Annual, "Love The Forest Concert." Jump, Jive & Wail Your Way Into The New Year! Live Music Tonight At Bistro Espresso‎ with Beeken! Firefall Ministries Presents "The Chalice"
Three Hikers Missing Outside Kennedy Meadows - Update...Safe & Sound! CoyoteFest … A Howl of an Event! They Came, They Tasted, They Judged...AND THE RESULTS ARE IN! Presidents’ Day Wine Weekend is Coming! For Your Bubbly Pleasure! Find The Perfect Bottle To Pop On New Years! The Wine Is Flowing & The Tasting Rooms Are Open!